We invite submissions from Artists for Entry in the tenth Sculpture on the Edge Awards. Sculpture on the Edge is a contemporary three-dimensional (3D) award exhibition, presented by Arts Connect Inc in the Sunshine Coast’s Hinterland over 30 days from 21 September – 13 October. The exhibition has been presented at Spicers Tamarind Retreat since 2012. We are proud to have the continued support of Spicers Tamarind Retreat as the Major Sponsor. 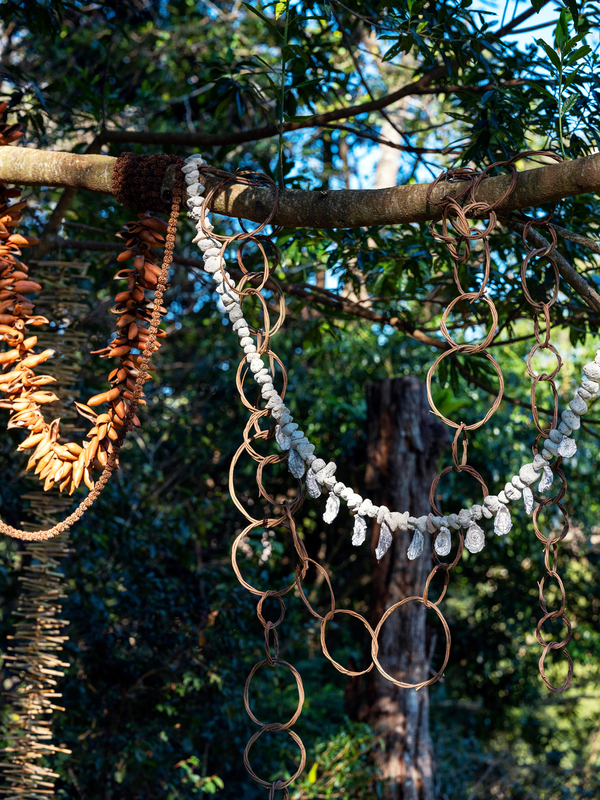 Sculpture on the Edge invites submissions from artists to design site-specific sculpture/s to be installed and nestled amongst the tranquil natural surrounds of Spicers Tamarind Retreat in Maleny on the Sunshine Coast’s Hinterland. Artists are encouraged to exercise their artistic expression and freedom, however the work should enhance and add to the appearance of Spicers Tamarind Retreat and contribute to the overall ambience of the Estate without impacting its function. Your artwork will be temporarily installed in the rainforest grounds of Spicers Tamarind Retreat, 88 Obi Lane East, Maleny, and open to the public for the duration of the exhibition. AWARD POOL of $10,000 with a major Award of $7,500. Entry Fee is $30 for Arts Connect Members and $50 for Non Members. Consider access requirements. There are areas at Tamarind Retreat that are not available for art display. Artists will be responsible for the maintenance and presentation of their work throughout the duration of the exhibition. Where grass is concerned please ensure you have considered easy access and safety for grounds maintenance i.e. lawn mowers and whipper snippers. Sculptures will be selected on the basis that they are suitable for outdoor installation. Artists are invited to visit and identify a specific location within the site and work within the restrictions and parameters, some of which are detailed in this brief. Those unable to visit or attend can communicate via email or phone with the organisers. All works entered into the prize must be available for display for the entire duration of the exhibition. Entries must remain available for exhibition and not be sold prior. The site is suitable for large and small works, but artists must consider the size and installation so that it is not easily moved. Consideration should also be given to public interaction and environmental weather factors. All entries submitted will be presented for review to a pre-selection panel, from which a maximum of 50 works will be selected. The pre-selection panel and Judge’s decisions are final and no correspondence will be entered into. All risk for the artwork remains with the artist. Spicers Tamarind Retreat is a private, safe location, but does not have 24 hour security. For ACI non-members, a copy of your public liability insurance certificate must be provided with your entry. Public Liability is provided for active Arts Connect members. You may choose to join before you enter. Information for Artist Public Liability Insurance can be found here. All works will be offered for sale for the duration of the Sculpture on the Edge exhibition. To achieve maximum sales for artists and financial viability for this event, Artists are requested not to submit pieces that have a sale price of more than $12,000. Arts Connect Inc will receive a commission of 25% which will be deducted from the sale price of all work sold. Arts Connect Inc is the sole owner of the information collected from the entry forms and any other information submitted, and will not sell, share or rent the information to others except for the sole purpose of advertising or promoting Sculpture on the Edge. Freight of the pre-selected works to and from the exhibition is the responsibility of the Artist. Larger works requiring special access or equipment to install must liaise & confirm details with the organisers at least 2 weeks prior to the installation date. Installation work will be the responsibility of the Artist and a site map of locations will be provided and negotiated with the artists once selection has occurred. Sculpture sites are not guaranteed. Your site will be finalised following a meeting with the organisers. We encourage artists successful in their submission to meet on site with the organisers for site allocation and installation matters. Final site selection is the decision of the organisers. If Artists are not available to install the works themselves, they must provide a representative to install the artwork and notify the organisers. Your Entry Form and Entry Fee, Attached images, Artist Statements and CV bio must be completed either Online (preferred method), or printed, filled out, scanned and emailed to admin@artsconnectinc.com.au, or printed, filled out and mailed to: PO Box 1033, Maleny QLD 4552 by Friday May 31 2019. Payment MUST be made at the time of entry and can be made Online or by direct payment to the ACI bank account. Please attach proof of payment with entry if paid by direct payment. Entries will not be accepted without proof of entry fee payment. PLEASE ENSURE YOU ATTACH THE NECESSARY FILES TO YOUR ENTRY: ENTRY FORM AND IMAGE FILES, CV BIO, ARTIST STATEMENT(S) Public Liability Insurance Certificate ( non-members only) and PROOF OF PAYMENT (if not made online). Expressions of Interest, and Entry into Sculpture on the Edge are open to all Artists. A pre-award selection process will select a maximum of 50 pieces from 3D work entered. Arts Connect Inc. & Spicers Tamarind Retreat reserve the right to determine the most appropriate method and location for displaying 3D works, and to refuse to display any works deemed inappropriate, of insufficient quality, or unsafe. Entries must be the original, unaided work of the entrant, completed within the two years prior to the entry closing date. Entries representing partnerships between individuals will be accepted as one entry and on the understanding that each partner’s contribution is deemed equal. No third party or commercial gallery may enter a work on behalf of an artist. No work submitted shall have been entered into the Sculpture on the Edge in any previous year. Artists pre-selected for Sculpture on the Edge will allow their works to be reproduced by print and electronic media in the advertising and promotion for the exhibition. Artists should take great care when preparing their submission so that the concept of the work, if not already constructed is clear and shows mock ups/ sketches from several angles. All expenses incurred in the submission of the entry are the responsibility of the Artist. All risk for the artwork remains with the artist, this applies for the installation, maintenance and removal of the sculptures. Sculptures will be selected on the basis that they are suitable and can sustain outdoor installation. For members of Arts Connect Inc. a non-refundable entry fee of $30 per entry is applicable and must accompany your Submission. For non-members, the non-refundable entry fee is $50 per entry. Non-members are required to hold their own insurance. You may wish to join ACI, which will give you public liability insurance. Ready to upload your entry?